Handmade Tulip -lilac stripes Set 8 Notecards on rust handmade banana paper. Adorable set of 8 THANK YOU notecards printed on fine quality photo paper mounted on linen stock textured paper enhanced with handmade rust colored banana fiber paper and with petite organza ribbon; notecards are accompanied with linen textured envelopes; each notecard includes a delicate color vellum lining for a beautiful presentation. Inside note card is left blank for your special message. Size is approx. 4 1/4" X 5 1/2". Note-cards set come in a clear box decorated with organza ribbon ready for gift giving. This beautiful set of notecards make a timeless gift! 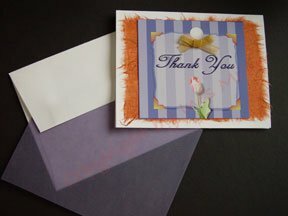 They can be use as thank you cards, invitations, get well cards, love or friendship notes.